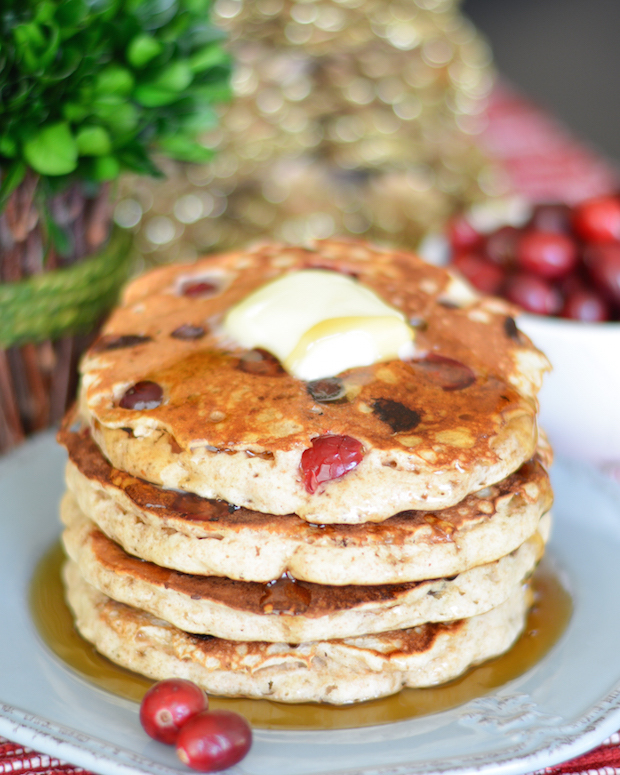 These Fresh Cranberry and Chocolate Chip Pancakes are a perfect festive way to use the pretty little seasonal fruits! The sweet and tart combination is just perfect, topped with a drizzle of real maple syrup! Cranberries!! I’ve always thought of them as a Thanksgiving thing. But this year I started realizing they are more of a winter/Christmas seasonal fruit. And they’re good for so much more than just cranberry sauce with your turkey. Every year, I see lots of delicious fresh cranberry recipes but I’ve never actually bought or used them! I finally decided 2015 was the year and picked up a bag of the little red gems on a recent Trader Joe’s run. Now… what to make, what to make? Whenever fruit is involved, breakfast comes to mind. And since pancakes are my favorite weekend breakfast to make, it only seemed natural to sneak a few into a batch! I packed my Dad’s Perfect Pancakes with lots of fresh cranberries, and some chocolate chips to balance out the tartness. I also used some whole wheat flour in this batch, to give them a little extra staying power. In a large bowl, mix flours, baking powder, salt and sugar. In a smaller bowl, beat together milk, egg, butter and vanilla. Pour the wet ingredients into the dry and whisk until there are no more lumps. If the batter seems to thick to mix, add another splash of milk. Let the batter rest a few minutes. In the meantime, heat a large, dry nonstick skillet over medium-high heat. Ladle pancakes batter into the skillet, then sprinkle on chocolate chips and cranberries. Once the pancake is nice and bubbly, peek underneath and see if it’s ready to flip! It should be nice and golden brown. Flip and cook on the other side a few minutes until golden. Serve with butter and real maple syrup! 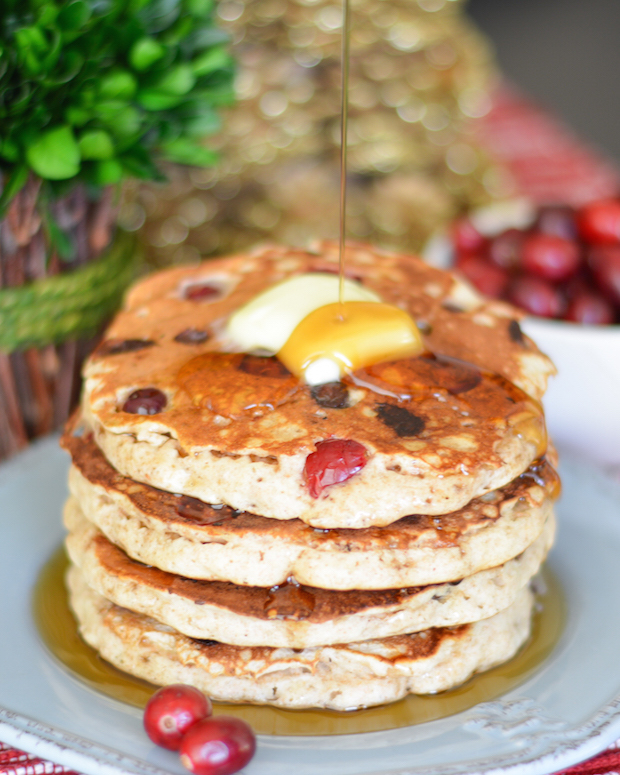 These pancakes were a perfect way to use my cranberries! I love how the warm fresh berries just pop with tartness in your mouth. Some real maple syrup on top really made these delicious. They’d be a perfect holiday breakfast! Speaking of holidays, have you done your shopping yet? Whenever shopping time rolls around, I always like to check out small businesses first. You can always find the most unique and adorable gifts! I love Etsy, but I’m also obsessed with all the small online boutique shops that are opening up. My friend Annie from the food blog Maebells recently started a really cute kitchen and home decor store called Gin Creek Kitchen. As a special surprise today I have teamed up with Gin Creek Kitchen and a group of my favorite bloggers to bring you a great giveaway! We are giving away GCK’s adorable Grocery Scale Kitchen Clock, just in time for the holidays! If you haven’t stopped by Gin Creek Kitchen yet it is an online shop specializing in Southern inspired kitchen and home decor. They have great items for your kitchen like decorative measuring cups and spoons, items for entertaining and wall decor! Hop over to Gin Creek Kitchen to check out all of the items and to do a little holiday shopping! Enter below to win a Grocery Scale Kitchen Clock from Gin Creek Kitchen! I love that you put the cranberries in pancakes! And I bet the chocolate chips + cranberries have amazing flavor together! These look delicious! Mmm what a delicious recipe!! Cranberries and chocolate are one of the best combos 🙂 these are my kind of breakfast. Wow these look so good! It’s probably not a good idea to read food blogs before I’ve had dinner haha! I’ve always thought of cranberries as more of a Thanksgiving fruit too, but I’ve been using them a lot this season! This looks like the perfect dish, Jess! Thanks, Gayle! I need to use them a few more times this winter! These are making my mouth water, Jess! So yummy. Pinned! I’m so crazy about fresh cranberries — every year I do more and more with them! These pancakes look incredible, and I love the sound of the chocolate chips with the cranberries! You should do it! So yummy!! So pretty!! I would eat this for breakfast, lunch and dinner!! You and me both! Thanks, Annie! I can’t get enough of fresh cranberries lately either! Love that you added them to pancakes! They’re so fluffy and sound amazing with the chocolate chips! 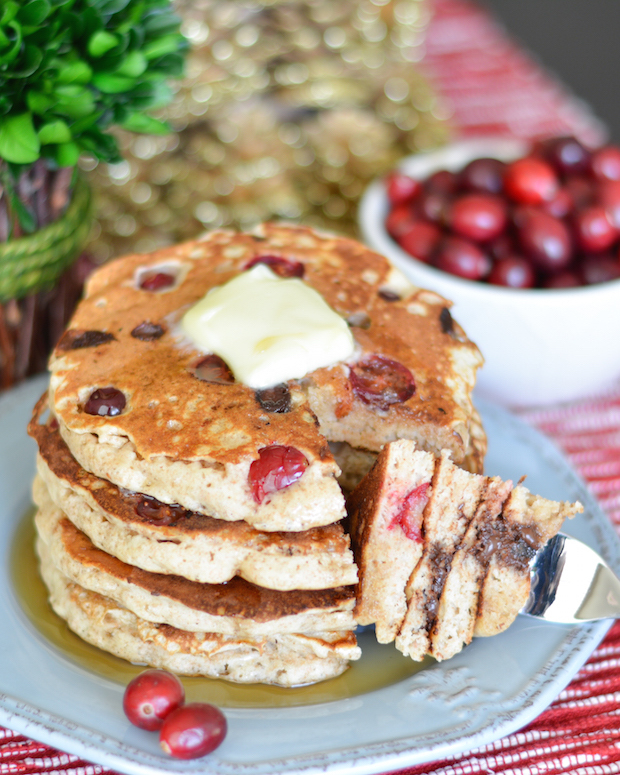 I LOVE this idea of cranberries in pancakes! That must be the perfect combination of sweet and tart! Great recipe, Jess! Thanks, Sam! They were really delicious! These pancakes looks so fluffy, that’s the best in my opinion! Love that you used chocolate and cranberries, such a great combination! This year is the first year I ever bought and baked with fresh cranberries too! These pancakes look amazing, I definitely need to try that! What a great idea to put cranberries in pancakes. I love the idea of a little tartness to balance the sweetness of pancakes. They look perfect!